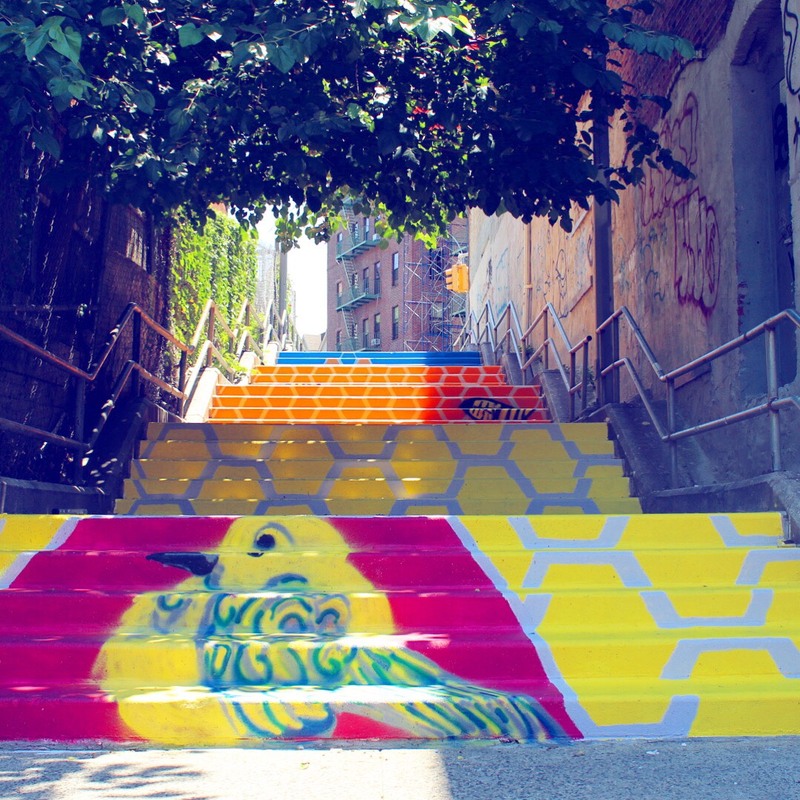 ArtBridge is pleased to announce the completion of three large-scale stepstreet mural installations in the South Bronx. Funding for this work was made possible by the KaBOOM! Play Everywhere Challenge, a national initiative to find creative opportunities to bring play into unexpected, everyday spaces. A panel consisting of Laura Alvarez, Lauren Click, DreamYard, the Department of Transportation, and the Department of Health and Mental Hygiene chose Bronx-based artists Diana Perea and Josie Gonzalez to create these murals. Diana Perea’s “Blue-Winged Warbler” can be found at Third Avenue and Weiher Court. It features a hexagonal pattern inspired by the honeycombs of beehives and the blue-winged warbler, a bird that calls the Bronx its home. Josie Gonzalez’ “Rise Up” is installed at Third Avenue and 164th Street. Power walk up and down the steps of this mural, as you journey through this mythical bird — part Phoenix, Thunderbird, Puerto Rican parrot and Quetzal — symbols of power and freedom in indigenous, Spanish-speaking and world communities. Indigenous Taino designs are painted along the border squares, inspired by petroglyphs created by the indigenous people of the Caribbean. Josie Gonzalez’ “Rise Up 2” is installed at Third Avenue and Boston Post Road. It is a step maze mural that features also features the mythical Power Bird. Stepstreets are an iconic part of the Bronx streetscape and a high-visibility location for public art. Thus, their nature-inspired imagery and bright, eye-catching murals — created in collaboration with local youth from DreamYard — bring a sense of play to these sites, transforming the pedestrian infrastructure into vibrant, health-promoting community assets.